Sometimes, I think my gift is gift wrapping. I find it therapeutic and relaxing, and not just when wrapping gifts for Christmas but for any other occasion as well. I enjoy putting some love into it and wrapping it up in style. I try to go for unique. I really don't like cookie cutter, plain boring vanilla, no-thought-was-put-into-it gift wrap. Though if I were offered a job wrapping holiday gifts at the mall I don't know if I would take it. I'd still do a very nice job wrapping but I know I wouldn't be able to go all out with creativity as I do here because nobody has time for that. Not at the mall. I'd insert a smiley face here but that would look tacky. So let's go on. Here are some helpful style tips for you wrappers. This is "use what you've got/no need to leave the house" type of thing. It's a fact: classy wrapping is expensive 💸 and affordable wrapping is tacky. TACKY. I'm not screaming, just wanted to put it in caps. OK wrappers, this isn't hard. You'll have some gifts that come with a box. If the box is pretty (no logos) but plain, embellish it with a strip of shimmery fabric and add a small piece of greenery clipped from outside. (Yeah, you do need to leave the house for that, but leave with your scissors not your wallet.) A dab of glue will keep the branch from falling off. A decorative, brown glittery twig broke off from what I had as a home decor accessory in a vase. So why not add it here. Tuck the fabric under lid flaps and secure it in place with a drop of glue. It's enough to put the glue only on the inside of the box cover - don't need to glue the whole fabric strip across the top. Wrapped ONLY in tissue paper that some store used to wrap their fragile goods at the checkout. When a cashier drops extra sheets in your shopping bag - why not reuse - it has no creases in it! Tissue and ribbon go a long way! Sure, it should be pretty. Although beauty is in the eye of the beholder, right? Here, I added an interesting detail - a Brass Moon. Just because. These 2 pieces of metal chain is broken jewelry. You can throw it out or you can get creative! Up to you how you see it - as trash or treasure. Shape it how you want it. Black bow looks classy, serious, sophisticated, stately, etc. Why not add some subdued bling to it - glam it up? Optional. You can create different looks depending on how creative you get. Again, to secure it a glue gun will be your friend here, too. A small amount just under the bow will do. Let the rest dangle! Details matter, I always say that. Detailed shot of how else you can position that bling. OR - go completely without it! I guess we can call this Modern Traditional. Don't worry, that's really a G. It's my font. Beauty is in simplicity. Wrapped in just plain white tissue paper. Again, this is another unique and very budget-friendly look. You use what you have and don't spend more than you need to. You probably have plain white tissue paper at home. Not toilet paper, not the one for noses either. The one that stores use to wrap fragile merchandise in. Just my opinion - why spend money buying white tissue which will have multiple creases anyway (because it's sold folded and packaged) when you can use what you've got from the purchases you make. It won't have that many creases, and plus you can ask a cashier for extra sheets in your shopping bag - those won't be wrinkled a bit and perfectly usable! Use 2 sheets for transparent/foggy look or 4-5 sheets for a matte-blanc look. I don't know which climate zone you live in, but here in Illinois, USA some bushes are green during winter. 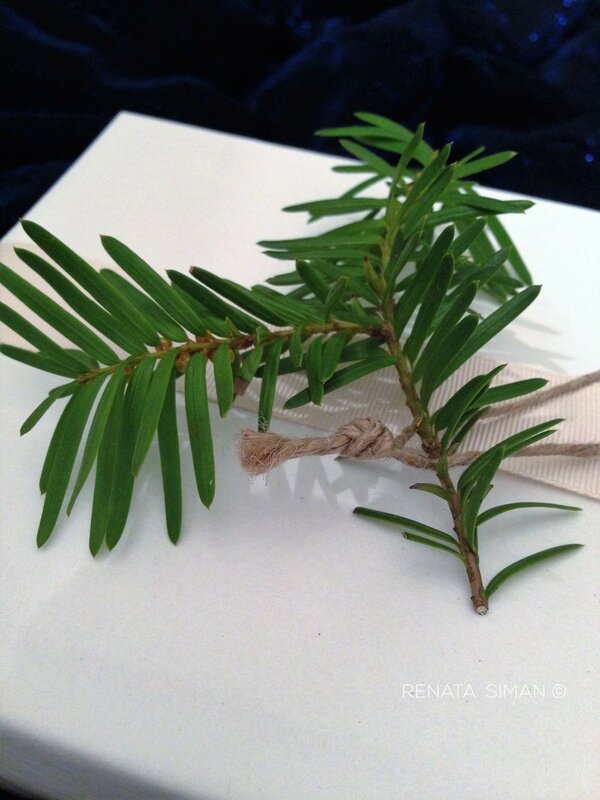 Get some evergreen clippings from outside and dress up your plain white gift. Jute twine goes perfectly with woodsy elements. I added a wide fabric ribbon in cream. No bow. Simply-stated. Wrap it around once, no knots. At the bottom of the gift connect the ends by having the edges meet and put a clear sticky tape over them. DIY name tags. Customizable a million ways! Ok, a hundred. Again, I'm preaching here - why go spend the money on gift tags and labels. Make very nice - original - gifts tags yourself. Customize ANY FONT you want and print them on yellowish manila folders. You have those! OK, maybe you don't. But you can print them on any paper - construction paper, wallpaper, stationery paper, craft paper. I could go on. Just make sure you cut that sheet of paper to size that fits your printer feed. Once it prints, cut that tag in any shape you want. I just went with a circle shape because it look like a Christmas ornament. Pinecone - one of the symbols of Winter. Again, tissue + ribbon is all you really need. Don't be afraid to wrap only in tissue. Use several sheets. Use a fabric ribbon instead of plastic. Fabric is classy, elegant, timeless, and more luxurious than using a plastic ribbon. And don't get me started on using plastic bows! Cringing. Make a beeline to the trash can with your half-deflated, depressed plastic bow. Gold pairs well with Red. Red is the most iconic color when it comes to Christmas. And it's my favorite color too. Nothing says more Christmas than a red ribbon bow. If you don't celebrate Christmas, by all means go with the color that is iconic to your Holiday, or the color that you like or the gift recipient likes. Classic. Elegant. Iconic. Luxurious, yet simple. Someone might say: and you call this wrapping?! Yeah, I call this wrapping. In fact, that's a wrap! You have a gift. Unwrap your gift wrapping skills - time to show off your talent! I hope these tips helped. Wouldn't you agree that it's better to put that money in a gift than in a gift wrap? Gift wrap almost everybody throws out. Money in the trash... So combine the new with the old, use what you've got and don't break the bank. Give it some Style! Tacky is not stylish. Happy gift giving, Happy Holidays and Merry Christmas! Now it's a wrap for sure!